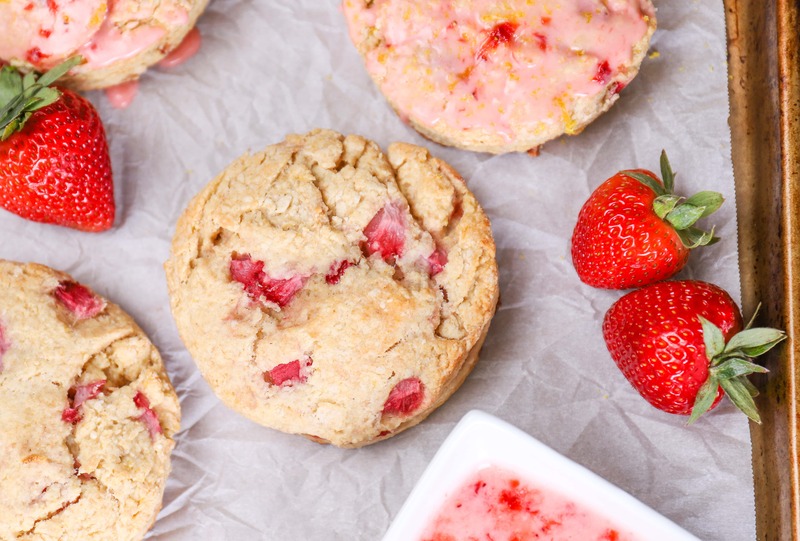 Days are better when they start with these Fresh Strawberry Scones that are bursting with sweet strawberries and topped with a lemon strawberry glaze! *Recipe from 03/28/12. Updated 05/29/18. It’s the first day back after a long weekend. It’s always hard to get back into the work routine after an extended break! The weekend was filled with lots of sun, friends, and good food. While I wish I was still spending all day outside instead of being stuck inside working, I’m taking comfort in the fact that, we can still eat good food! Starting the morning off with good food always helps. 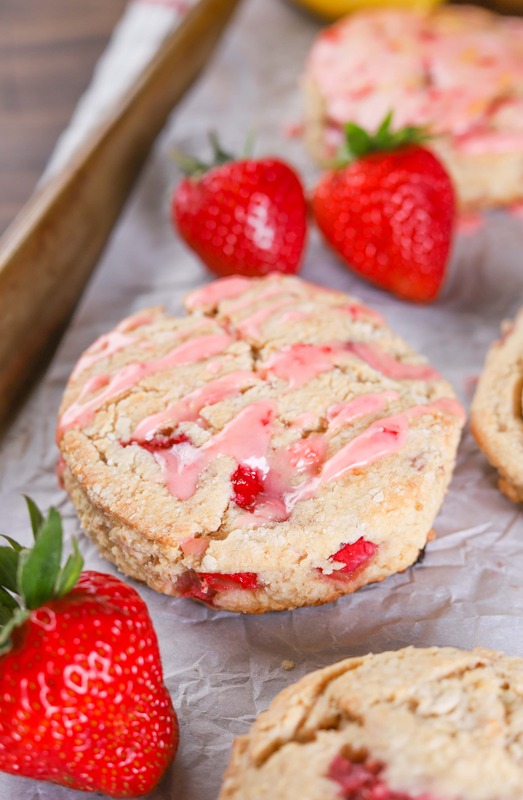 Thankfully there are a couple of these fresh strawberry scones left from our most recent batch! And to make work a little easier (or harder depending on how you look at it!) the sun is still shining. And we’ll be able to spend the evening outside! Given my recent baking binge with berries, it obviously wasn’t going to be long before scones appeared in my kitchen! Fresh strawberries combine with a bit of fresh lemon juice and zest to create a summer combination that will get your mornings started off right! Grab a cup of your favorite coffee and one of these scones and head outside for a few quiet moments before the crazy begins! 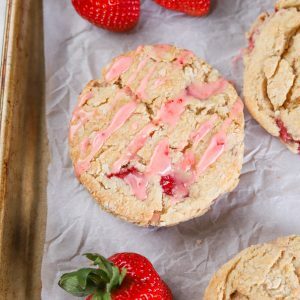 Using strawberries in scones can sometimes make the texture of a scone a little off. So, I’ve included some tips that I follow to make sure the insides aren’t soggy or chewy. Make sure your strawberries are as dry as possible. I like to take care of the berries first before starting to make the recipe. I start by rinsing the berries, patting them dry, and then dicing them. Once they’re diced, lay them out on a paper towel to soak up the extra moisture. Then prepare the rest of the scones. Gently mix the strawberries in with your hands. This will help keep the strawberries from getting mashed. Stir the wet ingredients in just until moistened. Don’t worry if it isn’t all wet. The dough will come together when you knead it. You will want to bake the scones until they are golden brown on the edges. If you pull them out before the edges are golden, the insides with be too moist and will become soggy. If your kitchen is warm, these scones should be eaten within a couple of days for best results. If you’re not going to eat them all the same day, only glaze the scones you are going to eat and put the glaze in a container to use when you need it for the rest of the scones. Preheat oven to 400 F. Line a baking sheet with parchment paper or a silicone baking mat. In a large bowl, whisk together flours, sugar, baking powder, baking soda, and salt. Gently stir in (or toss with hands) diced strawberries and lemon zest. In a small bowl, whisk together yogurt, lemon juice, and egg. Add wet ingredients to dry ingredients and stir until just combined. Turn dough out onto floured surface. Knead dough 5-6 times until dough comes together. Gently shape into an 8 inch circle. Cut into 8 pieces and place on prepared baking sheet. Or use a biscuit/cookie cutter and cut out scones and place on prepared baking sheet. Bake for 15-18 minutes or until just turning golden brown. Transfer to wire rack to cool. While scones are cooling, combine lemon juice and confectioner’s sugar until smooth. Add strawberry and beat with a hand mixer until strawberry is pureed. Or use a fork and mash the strawberry in until blended. Drizzle over cooled scones. If you want to dip the tops of the scones in, you will need to make a double batch of the glaze. Allow glaze to harden and serve. Oh, wow, these look yummy! I bet the addition of the glaze was super delish. I’m going to have to try this recipe! These look great. I love scones! 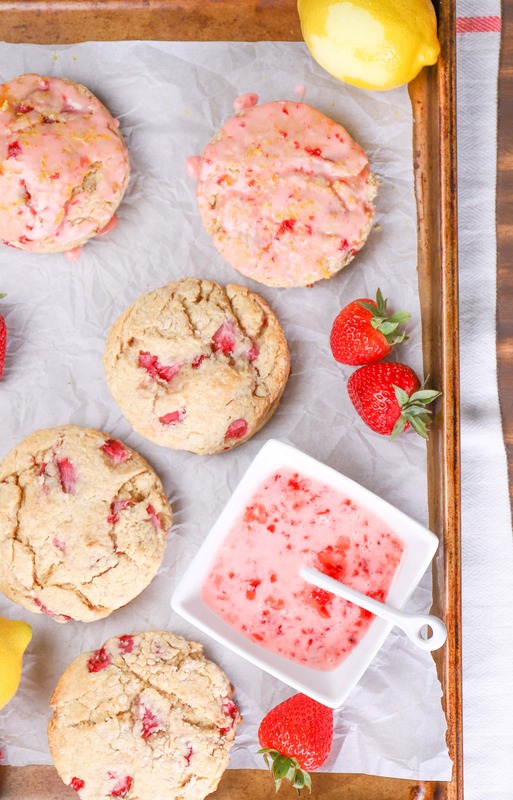 While I’m not a scone fan, I love the fresh strawberries in this 🙂 Looks so refreshing! 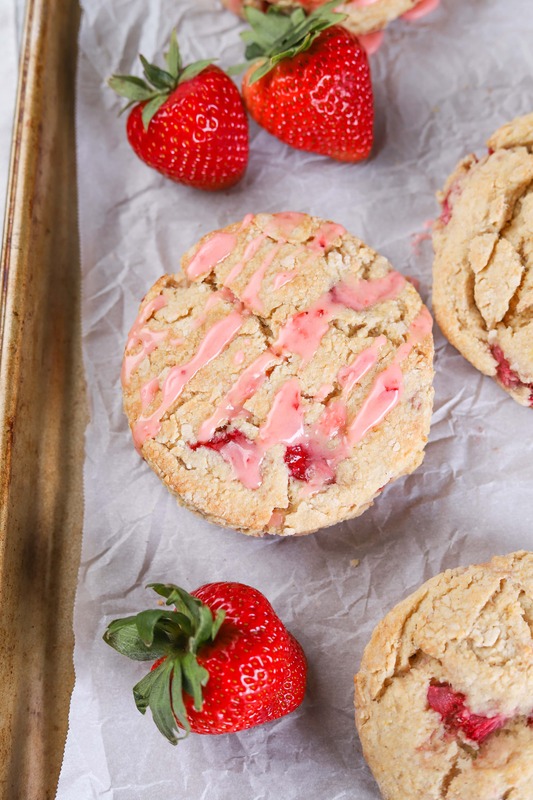 i love scones and i love strawberries…these look so fantastic and springlike! yum! I love scones. They always make breakfast so much better. I adore the idea of a lemon glaze. Sounds so zingy and the perfect complement to strawberry scones. Yum! Your scones look wonderful! So perfect for breakfast! You nailed Sue’s recipe! These look super yummy (and pretty too!) I love those ruby red berries. Yes I pinned and am following you now! Great stuff. 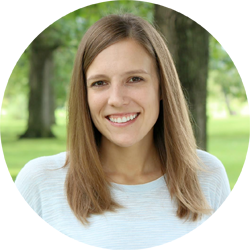 Sarah at http://www.theeaseoffreeze.com! Oh yum! These look so pretty and scrumptious. I would so love these for breakfast or afternoon tea. these look amazing! Love lemon & strawberries!